Shanghai, January 15, 2018—This year, Shanghai Disney Resort will welcome a magical new year, the Year of the Dog, combining Chinese traditions and festivities with Disney magic and fun, offering guests unlimited opportunities to celebrate the new year unlike anywhere in China. Throughout the resort, guests will be immersed in the holiday atmosphere as they discover new entertainment honoring Chinese traditions with charming Disney surprises. 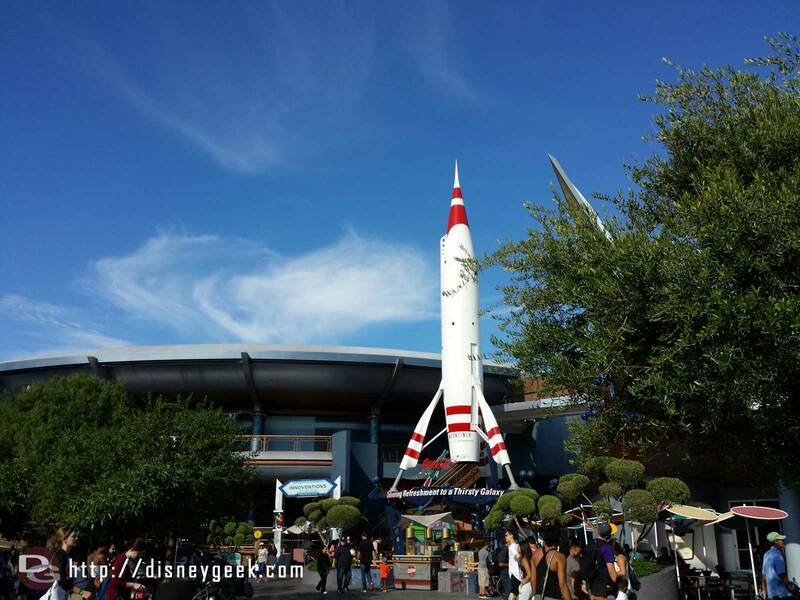 Guests will enjoy their favorite characters dressed up for holiday, unique new year wish activities, exclusive themed merchandise, delicious holiday cuisine, and more. 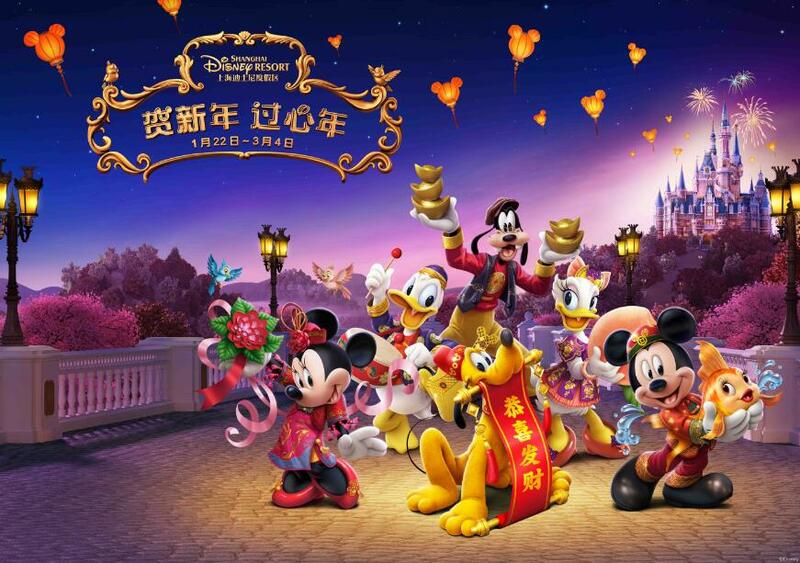 From January 22 through March 4, 2018, Shanghai Disney Resort is the perfect place for friends and family to re-connect and create a magical tradition this Chinese New Year. 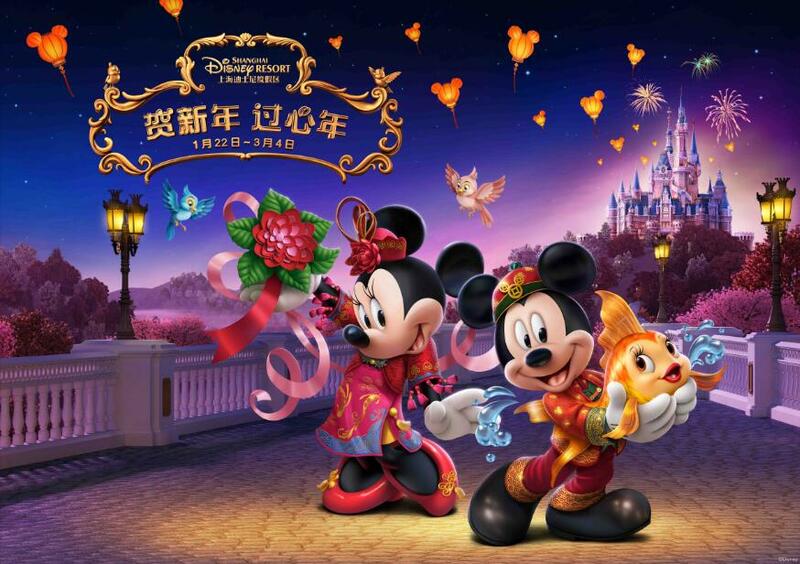 This year, Shanghai Disney Resort will be magnificently decorated with Chinese New Year themes, colors and décor encompassing the entire resort, with bright red and gold Mickey lanterns, traditional Chinese Couplets, bright flowers and other holiday-influenced decorations that will ignite warm memories and inspire guests of all ages. Throughout the holiday season, Mickey Avenue will be a hub of celebration, hosting Mickey Mouse and his pals dressed in their Chinese New Year outfits to take photos with guests in front of themed photo backdrops. 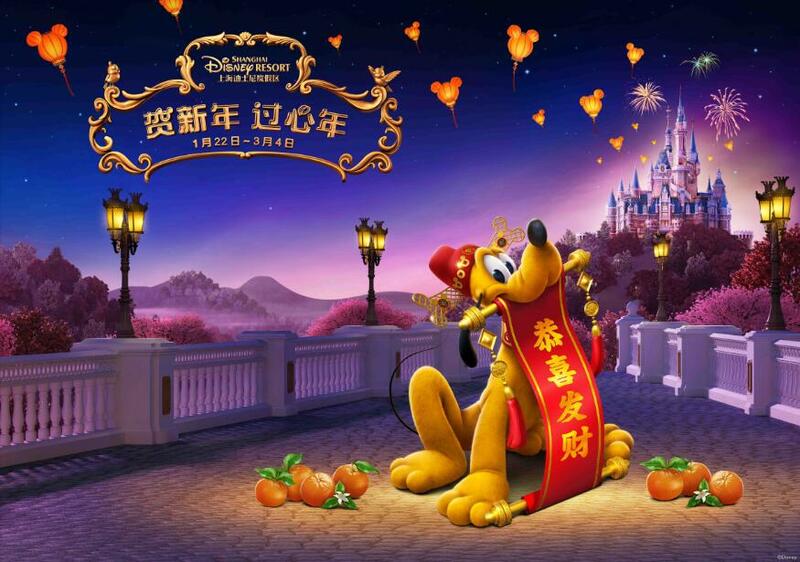 Pluto will be bringing extra energy to the Year of the Dog celebration, dressed in his “god of fortune” costume. On the bustling avenue, lucky guests will also be treated to special wishing cards and golden chocolate coins that symbolize good fortune. As an authentic Chinese New Year tradition, a daily drum ceremony in the Gardens of Imagination—led by none other than Mickey, Minnie and Pluto—will welcome guests as they arrive to Shanghai Disneyland, beating classic rhythms that will fill each day with wishes for prosperity and happiness. 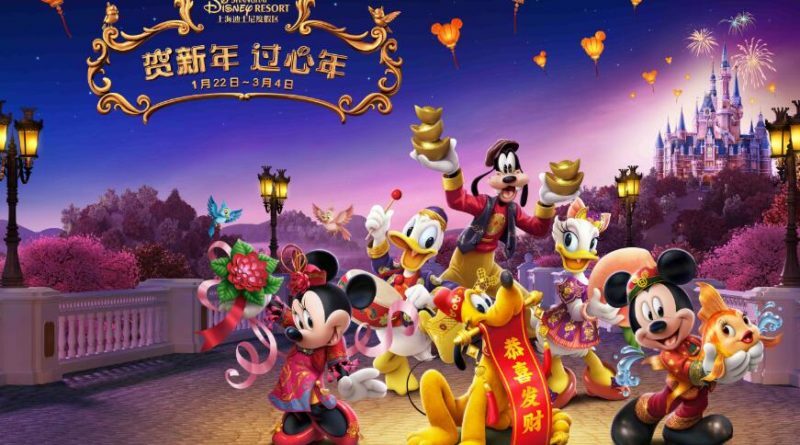 Adding to the fun and excitement of the holiday, at special times throughout the day, Mickey and the gang will gather on Celebration Square for a brand-new, high-energy performance: Shanghai Swing. Inspired by the Lunar New Year and Shanghai’s historic jazz and swing traditions, Shanghai Swing will feature Characters and dancers in beautiful vintage Shanghai costumes. 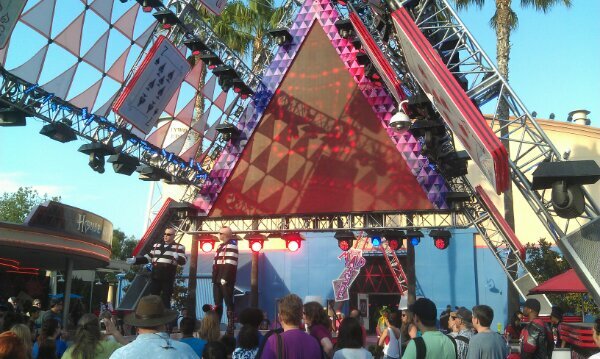 Guests will enjoy watching the dances and even trying their own moves, too. Guests can carry those wishing cards with them and find even more cards in the Garden of the Twelve Friends, which has been transformed into a magical “Wishing Garden” for the holiday. Guests can write down their new year wishes on special wishing cards, then hang their cards in the park’s first-ever wishing garden to embrace and welcome a magical year ahead. To officially kick off the Year of the Dog, on February 16 a traditional eye dotting ceremony will take place at Storyteller Statue. The two resort hotels will also feature bountiful holiday décor that welcomes guests during their visit. Toy Story Hotel will delight youngsters with toy- and character-inspired lanterns and colorful Year of the Dog symbols, while classic red and gold Mickey lanterns and dazzling Chinese New Year flowers create a warm holiday atmosphere in the Shanghai Disneyland Hotel. During Chinese New Year, dining is an important part of the magic and celebration. 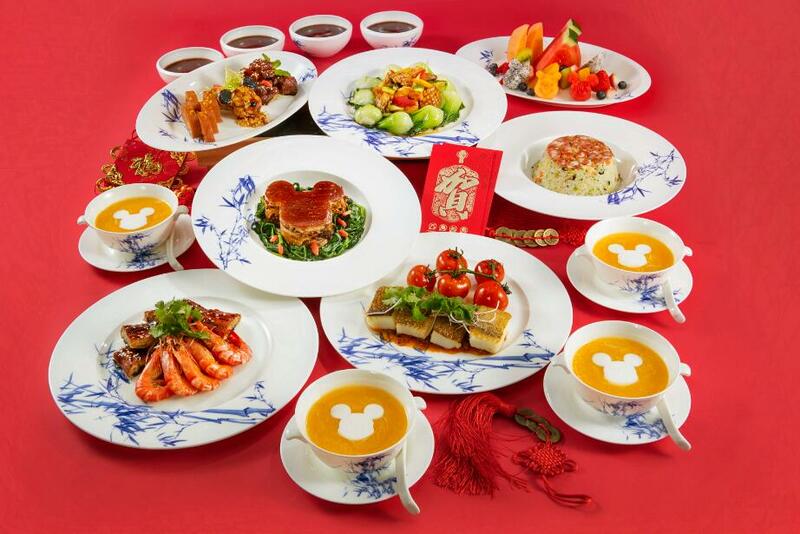 Throughout the new year period, guests can enjoy their family reunion dinner with favorite traditional comfort foods at Shanghai Disney Resort, creating long-lasting holiday memories with tantalizing dining options at every turn. 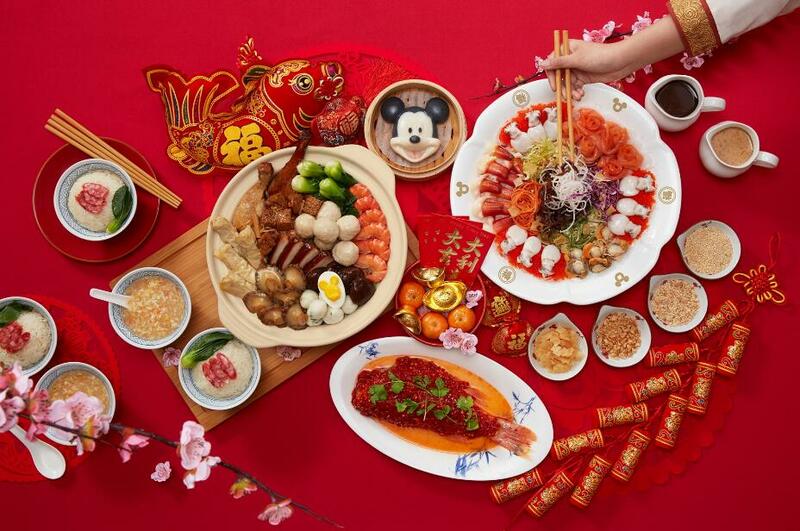 Inside the park, guests can enjoy a traditional familial banquet with Wandering Moon Restaurant Family Feast, where relatives and friends can gather together to enjoy this authentic taste of the Chinese New Year with seafood dishes for the entire family. Guests can also book an unforgettable meal at the Royal Banquet Hall, which is hosting a special holiday dinner this year with unique dishes like Mickey Shaped Braised Pork Knuckle, Cinderella’s Pumpkin with Braised Pork in Soya Sauce, and more. Time-honored recipes will feature unique Disney touches with a variety of options from on-the-go snacks to sumptuous fine-dining feasts. 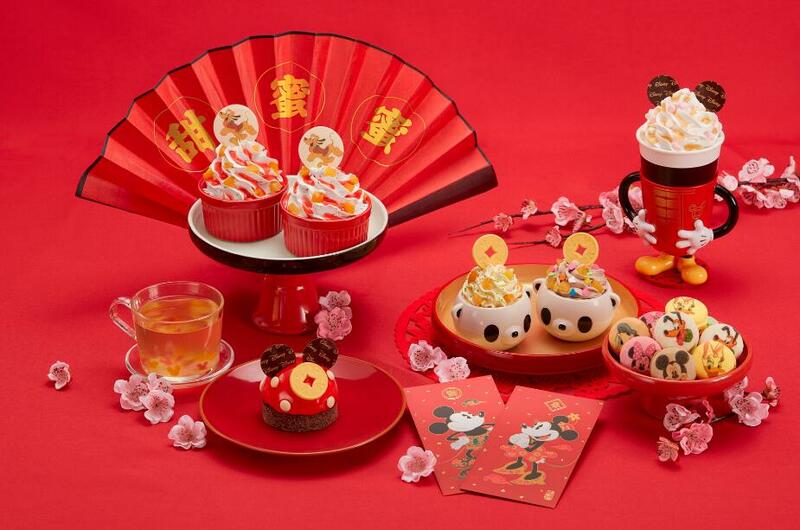 Remy’s Patisserie and Il Paperino are also releasing new Chinese New Year specialties with decorative mousse cake, sacher cake, ice cream Sundae, waffle and other exclusive new delights like collectible Chinese New Year Mickey, Minnie and Duffy popcorn buckets. In Shanghai Disneyland Hotel, Lumiere’s Kitchen will be hosting a special buffet dinner and weekend brunch during the festival period, while Aurora’s gourmet menu will see new holiday additions like Yunnan infused scampi salad, grouper and Aurora peaches. Toy Story Hotel’s Sunnyside Café will also be hosting a Chinese New Year buffet, while guests will also find on-the-go holiday-inspired offerings in Sunnyside Market. Chinese New Year shopping is part of a tradition as guests wish for a prosperous year to come. 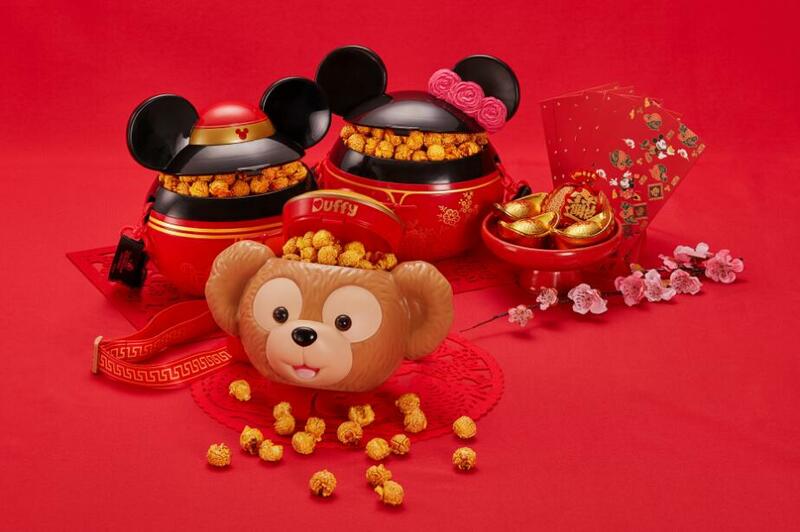 This year, Sweethearts Confectionery and Marketplace in Disneytown will be transformed into to fun shopping carnivals where guests can check holiday shopping off the list with trendy Chinese New Year gifts. The stores will be decorated with reimagined classic Chinese elements like archways, lanterns and blossoms, immersing guests in a festive atmosphere. 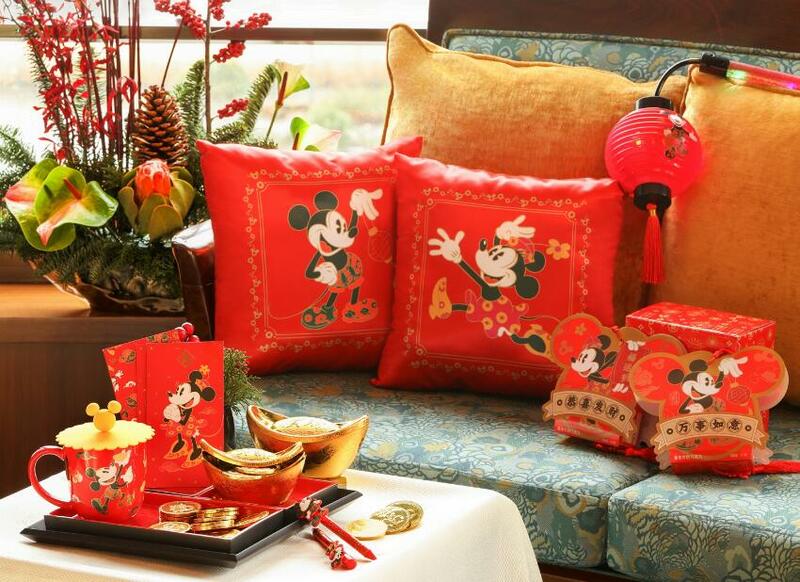 This year, Shanghai Disney Resort is releasing more than 40 specially designed Chinese New Year merchandise items for a limited time only. The new line reflects New Year themes of happiness and prosperity, incorporating bold red and gold colors, exclusive lantern patterns, copper coins, gold ingots, auspicious clouds and other traditional Chinese elements. A vast assortment of exclusive items including pins, stationery, collectibles, chocolates, and more, will serve as perfect gifts for family and friends of all ages. 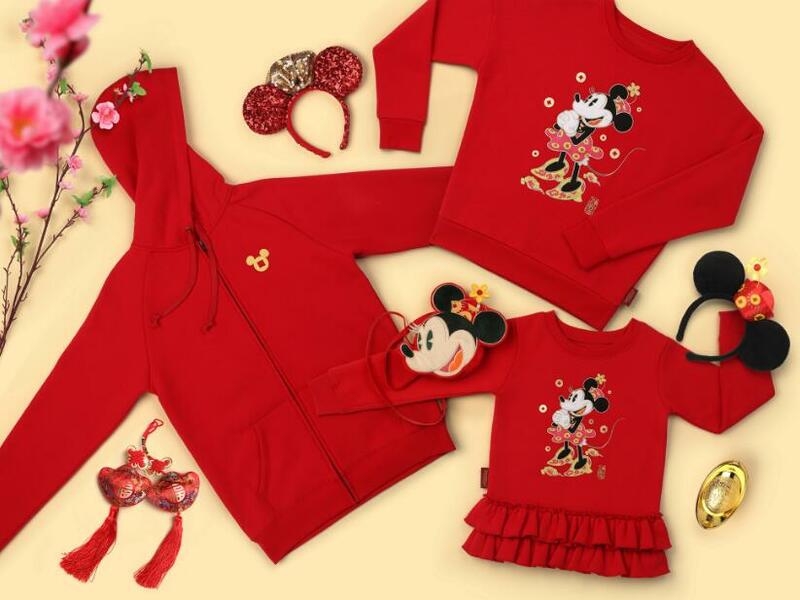 Hot new items include Mickey, Minnie, Duffy and ShellieMay in their authentic Lunar New Year outfits. Families will also discover newly designed matching apparel featuring traditional embroidery with unique Disney style. What’s more, guests can enjoy the special Disney PhotoPass offerings, with new year photo frames and limited edition PhotoPass One Day Passes. Brand new Year of the Dog-themed merchandise featuring the beloved Disney dog Pluto offers a great way to commemorate the new year and a magical trip to Shanghai Disney Resort. 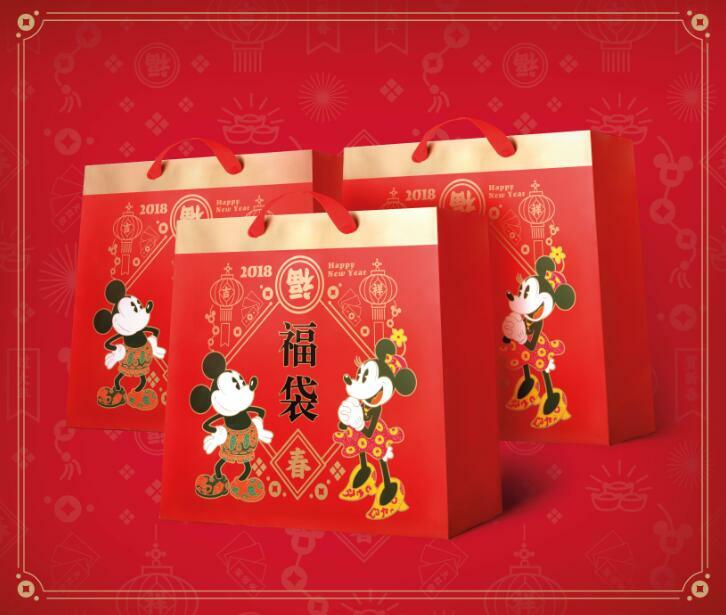 Plus, the fan-favorite Lucky Bags which feature a surprise assortment of the season’s most exciting new year items has already been the best seller since its launch. Guests purchasing the Lucky Bags will have the added chance to win surprise prizes, such as roundtrip air ticket to Hong Kong sponsored by China Eastern Airline, PhotoPass One Day Pass sponsored by Pictureworks and many more! Adjacent to Shanghai Disneyland, Disneytown is also gearing up for a magical Lunar New Year, with an immersive holiday atmosphere featuring beautiful lanterns plus more decorations that honor festival traditions, all in Disney style. Guests can also bring happy memory home by taking photos at the backdrops detailed with Mickey, Pluto and symbols of luck and fortune. A special Chinese New Year Carnival will be held every weekend until February 21 including the first day until the sixth day of the Lunar New Year, with a diverse and engaging assortment of handicrafts, live shows by Chinese folk artists and interactive activities for guests of all ages. 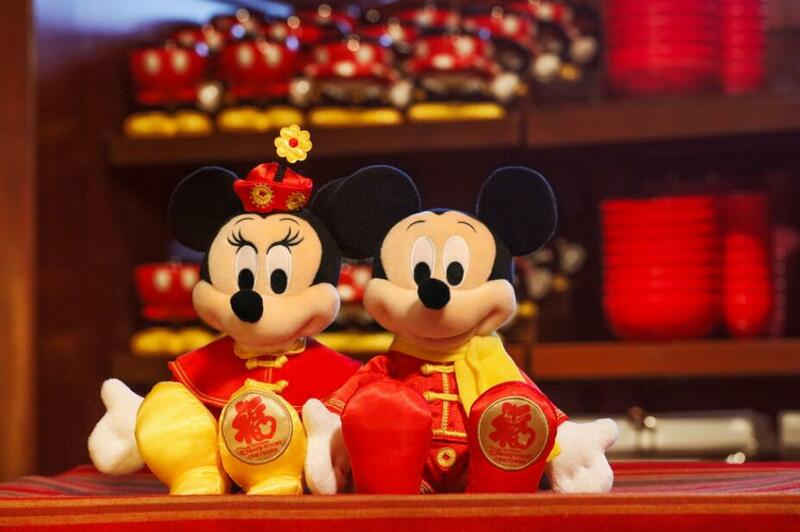 Meet Pluto and new year themed workshops are prepared for guests to immerse in this heartfelt Chinese New Year with Disney magic.